Inspire the kids to use their imaginations and put on their thinking caps with our fun ‘Word Parts’ English worksheet. 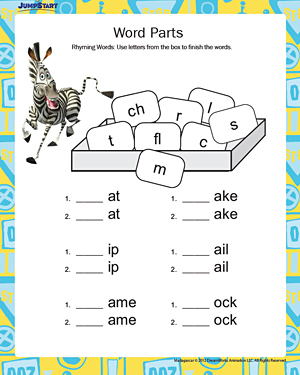 For this practice worksheet, your child can mix and match different letters to fill the first spot of the incomplete words on the worksheet. Experiment with different letters and word combinations to help your child improve their vocabulary!